The R-PLEX Human Tenascin C Antibody Set includes a matched capture and detection antibody pair and calibrator for the quick and easy measurement of Tenascin C in biological samples. R-PLEX products leverage MSD’s electrochemiluminescence technology for better sensitivity and a larger dynamic range than traditional ELISAs. R-PLEX matched antibody sets enable the development of singleplex and multiplex immunoassays. Individual assays may be developed using MSD avidin- or streptavidin-coated plates. Custom multiplex assays with any combination of R-PLEX analytes, as well as R-PLEX plus U-PLEX analytes can be developed on U-PLEX MULTI-SPOT plates. To learn more about the advantages of R-PLEX products click here. 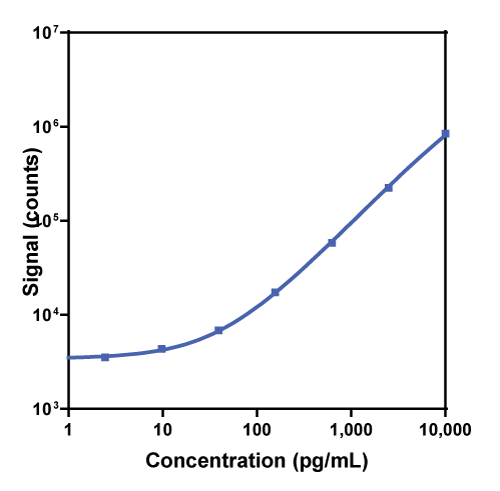 Calibration curve for the R-PLEX Human Tenascin C Antibody Set was assessed and representative data is presented below. Description - Tenascin C (TNC, DFNA56, GMEM, GP, HXB, JI, TN) is a member of the tenascin group of extracellular matrix glycoproteins involved in vertebrate development, tissue injury, and repair. Tenascin C functions as a homohexamer (1500 kDa) formed through disulfide linkages in its N-terminal domain. Tenascin C is highly expressed during development for embryogenesis and organogenesis, but nearly undetectable in adults; however, its expression increases in adults during wound healing and neoplastic events.